St Mark’s Review has been a leading journal of Christian thought and opinion since 1955. 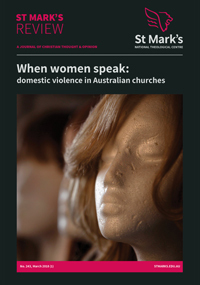 The Review aims at lively, responsible and relevant discussions of matters that of importance to the Christian community in Australia and for the life of our society. Each issue of the Review is dedicated to a specific theme and articles are commissioned to address that theme. Most articles featured in the Review are intended for anyone with a broad interest in theological questions and religious questions of contemporary significance. Specialists will also find the fruits of fresh thinking from a community of scholars determined to engage in dialogue with both the Church and the world.